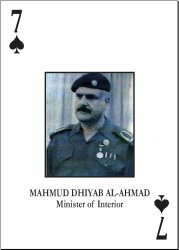 Mahmud Dhiyab Al-Ahmad was Minister of Interior under Saddam Hussein's regime. His capture was reported by CENTCOM on July 9, 2003. No futher information was disclosed by CENTCOM. Confusingly, CENTCOM reported again his capture in an August 9, 2003 press release. Mahmud Dhiyab al-Ahmad was reportedly under custody after having surrendered to coalition forces the day prior.